With a brief ceremony two days ahead of schedule, Iraq was returned to sovereignty Monday. President Bush and British Prime Minister Tony Blair, the two determined architects of the war against Saddam Hussein, celebrated the move. "The Iraqi people have their country back," Mr. Bush said. At around 10:26 a.m. Baghdad time — 2:26 a.m. 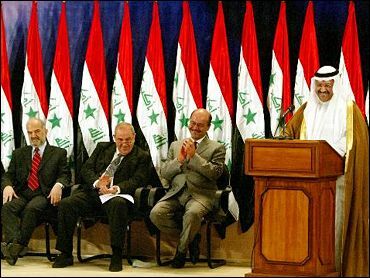 ET — legal documents handing over sovereignty were handed over by U.S. governor L. Paul Bremer to interim Prime Minister Iyad Allawi. "This is a historical day," Allawi said. "We feel we are capable of controlling the security situation." Almost immediately, Bremer headed home on an Air Force jet. The new U.S. ambassador, John Negroponte arrived in the country later in the day to oversee a massive diplomatic mission in Baghdad. In the capital, the streets were almost empty and there were no exuberant scenes of jubilation like those that greeted the fall of Saddam's statue in April 2003 as U.S. troops swept into the capital. Still, many Iraqis greeted the return of sovereignty as a hopeful sign that things will eventually get better. "Thanks be to God. We are happy. It's a step in the right direction," Ali Hussein Ali, a retired teacher. Former U.S. Ambassador William Luers, now CEO of the foreign policy group United Nations Association of the United States of America, says no one should discount the effect of optimism. "Nationalism is alive in Iraq," he said. "None of us know how the Iraqis – even the determined insurgents – will be affected by this. The strategy, over the next several weeks and months, will be to try to include more and more of those renegades in the political process. Politics are going to help resolve this problem." Hours after the transfer of power, Al-Jazeera television reported Iraqi militants killed American hostage Spc. Keith M. Maupin, 20. Maupin, of Batavia, Ohio, was captured during an ambush on a convoy west of Baghdad on April 9. The U.S. military is seeing evidence of a worrying rebel alliance among secular guerrillas fighting with guns and grenades who have joined forces with car-bomb building terrorists. Saddam Hussein will appear before an Iraqi judge in the "next few days" to face charges related to his 23 years in power, Iraqi and coalition officials said Monday. A military spokesman said he will remain in a U.S.-run jail for now because Iraqi government does not have a suitable prison. NATO leaders agreed to help train Iraq's armed forces. The NATO decision falls well short of U.S. hopes that NATO would assume a major military role in Iraq. The family of Cpl. Wassef Ali Hassoun asked people of the world to pray for his release. Arab satellite television network Al-Jazeera broadcast videotape from a militant group threatening to behead Hassoun if the U.S. military did not release all prisoners in Iraq. Iraq is in talks with Jordan to regain its civilian planes that have been kept at an Amman airport since 1991, an Iraqi Cabinet official said Monday. The surprise decision to suddenly move forward with the transfer of power was driven by fear of possible widespread, coordinated attacks to disrupt the handover, reports CBS News Anchor Dan Rather. The brief handover ceremony took place in virtual secrecy in the heavily guarded U.S.-led coalition headquarters, with very few people in attendance, no fanfare and no live broadcast — a reminder of the often desperate security situation on the ground. White House spokesman Scott McClellan said Mr. Bush learned during the NATO summit that the handover had been completed. He was passed a note written by national security adviser Condoleezza Rice, that said: "Mr. President, Iraq is sovereign. Letter was passed from Bremer at 10:26 a.m. Iraq time — Condi." Mr. Bush scribbled "Let freedom reign!" on the note and passed it back to Rice, McClellan said. Mr. Bush marked the transfer with a whispered comment and a handshake with Blair, gathered with world leaders around a table at the summit. Stealing a glance at his watch, Mr. Bush put his hand over his mouth to guard his remarks, leaned toward Blair and then put out his hand for a shake. Defense Secretary Donald H. Rumsfeld, a row behind the president, beamed. Later, Mr. Bush said: "We have kept our word" to deliver freedom and a new government to the Iraqi people. "We pledged to end a dangerous regime, to free the oppressed and to restore sovereignty," he said. Though Mr. Bush and Blair referred to the transfer as a handover of "full sovereignty," some 138,000 American troops remain in Iraq and the United States will have the main role in Iraqi security. Bush administration officials expressed optimism that the early transfer of power would strengthen the new government's hand to deal with rampant violence and the threat of terrorism. In the 15 months since Mr. Bush ordered the invasion of Iraq, more than 800 U.S. soldiers and more than 50 British soldiers have been killed, and a surge of violence preceded the handover that was scheduled for Wednesday. Mr. Bush offered Allawi a green light to impose martial law if necessary and take other hard-line measures to deal with terrorists. Both supporters and opponents of the U.S.-led war hailed the transfer of sovereignty as good news and said they wished the new interim Iraqi administration well in facing the major challenges ahead. Poland's deputy defense minister, Janusz Zemke, told The Associated Press, "This is very good. Everything that accelerates the process of transfer of power to the Iraqis, that speeds up their taking of responsibility, is very good." Germany, a staunch opponent of the war, said the change in timing did not matter much, but the fact of Iraqi control was crucial. "We welcome the transfer of sovereignty that took place today," Foreign Ministry spokeswoman Antje Leendertse said. "For Iraq, this is an important step on the road back into the community of independent nations." Senior Syrian Information Ministry official Ahmad Haj Ali told Arab broadcaster Al-Jazeera that the Iraqi government should send away coalition forces and avoid U.S. influence. "There will be great security problems as a result of the U.S. presence, and problems created by the Americans themselves," he said. "The government can make it if it adheres to its programs and ends the presence of the U.S. and other troops."